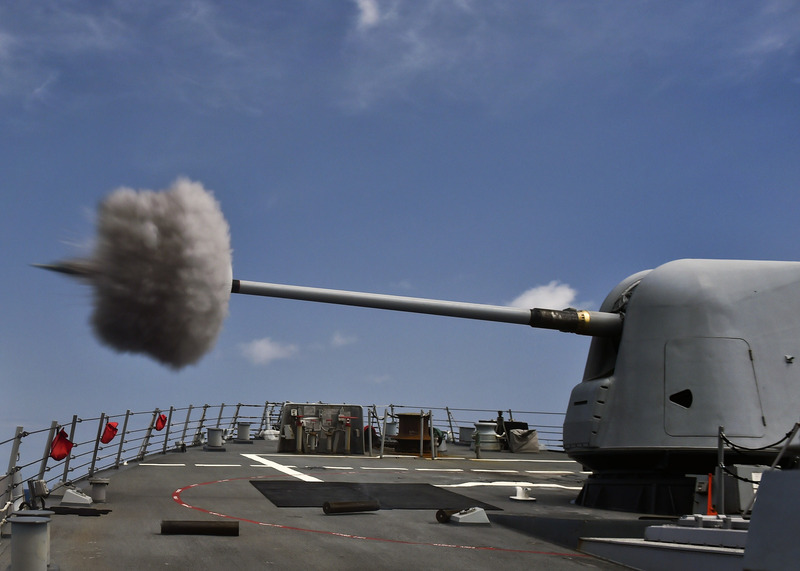 PENTAGON — The Navy is still interested in pursuing guided rounds for naval guns on its surface fleet but waiting for the technology to get cheaper before moving forward, the director of surface warfare said Wednesday in a press briefing with reporters. The Navy has pursued a guided five-inch round for the service’s Mk 45 five inch guns on its guided missiles cruisers and destroyers in fits and starts since the mid-1990s with limited success. “I’m at a point where I’m extraordinarily interested in as soon as the cost comes down to something I can make a reasonable case for,” said Rear Adm. Peter Fanta. The idea is to fire a rocket assisted guided weapon far beyond the 13 nautical mile range of the standard munitions to strike targets accurately faster and more cheaply than longer range guided missiles. The Navy has been successful procuring guided weapons for the 155mm Advanced Gun System for the Zumwalt-class (DDG-1000) guided missile destroyers — the BAE Systems Long-Range Land Attack Projectile (LRLAP). But reducing the size to the smaller MK 45 weapon has been a challenge for the service. In 2008, the Navy canceled the Raytheon’s five-inch Extended Range Guided Munition (ERGM) after a failed 15 years development process. Last year the Navy began reexamining the guided round question. Raytheon, BAE Systems, Oto Melara and Lockheed Martin are all thought to have responded to NAVSEA’s RFI. But cost will still be a prime factor for further work. “At this point I’m still not convinced that the cost still doesn’t have a significant chunk to be reduced,” Fanta said. Sam LaGrone is the editor of USNI News.